This is a particularly engaging example of child portraiture, the genre in which Hone excelled. Born in Dublin in 1718, little is known of his training, though his early pastels suggest that he may have studied with Robert West, when he was still running a private academy, prior to it being taken over by the Dublin Society. Hone moved to England at an early age and worked primarily as a painter of miniatures. In 1742 he married an heiress, Mary Earl, at York Minister. Pasquin, clearly a biased witness, with something of a vendetta against the artist, gives a hostile account of Hone’s evident affinity with children, telling how he would lodge at the best in a town and having asked to dine with the family, would lavish praise on their children before offering to paint them: ‘the portmanteau was unpacked, the operations began; while the fond and partial parents hung in rapture over his shoulder….Thus he made his establishment secure, and gave general satisfaction, by offending truth and outraging taste; making the children as angels, the mother as a Venus, and the husband a well-fed Job, in a brown periwig’. Hone was appointed one of the directors of the Society of Incorporated Artists in 1766 but resigned two years later to be become a founding member of the Royal Academy. 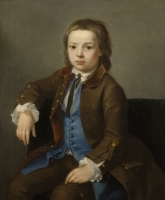 He exhibited his charming The Piping Boy – a portrait of his son Camillus – (National Gallery of Ireland) in the Academy’s first exhibition and sent a total of sixty-nine works to their annual shows. However, as is well known, Hone, sometimes a difficult man, fell out with his fellow academicians and had a long-standing feud with Sir Joshua Reynolds – proposing Gainsborough for the Presidency in 1774. Things culminated the following year in the controversy surrounding The Conjuror (National Gallery of Ireland) in which Hone caricatures Reynolds, satirising his supposed plagiarism by including prints of the old masters which, he suggests, the Academy’s President had re-used in his work. Particular offence was taken to a female figure interpreted as representing Angelica Kauffmann, with whom Reynolds was rumoured to have had an affair. Although this was painted out, the work was rejected for hanging by the Academy and Hone exhibited it privately, together with almost a hundred other of his works, in one of the very first one-man shows, in St Martin’s Lane. The only work that Hone did exhibit at the Academy that year was the famous Spartan Boy (private collection), perhaps his finest child portrait, which Walpole admired at the exhibition for its colouring and expression. As noted above, Hone is famously at his best at portraying children. Waterhouse in his Dictionary notes how the artist was inspired to paint his most original and sensitive works by his son Camillus while le Harivel writes: ‘his affinity for children often captures the transience of childhood, [and is] surpassed only by Gainsborough’. 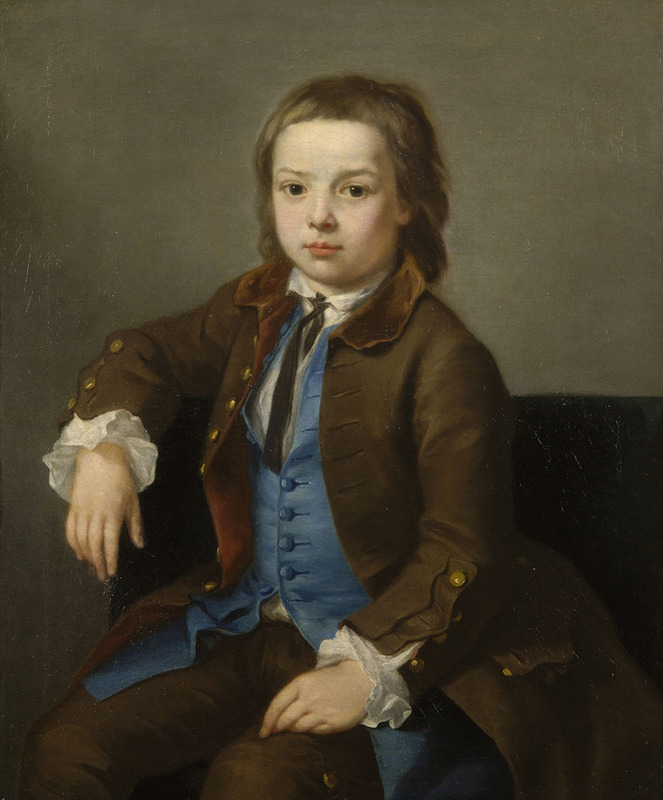 Here, the young boy sits on a chair, one arm resting on its top as if he has been posed slightly against his will. This apparent reticence is, however, belied by his confident and expressive engagement directly with the painter whom he faces, and so with the viewer. It is a work of great charm, freshness and immediacy. Hone perfectly captures a characteristic mixture of shyness and mischief in the young boy’s face and, in this, it can be directly compared with a further work by the artist showing a child of a similar age, in rather similar costume (private collection, formerly with Agnews). Both paintings share the ‘slightly excessive brightness of expression (effected by the highlights in the eyes)’ which characterises Hone’s work. Again the costume and handling of paint is close to The Sketching Boy (National Gallery of Ireland), a portrait of another son Horace, who was himself to become an eminent miniaturist. The intimacy of the present work would suggest that it is of a family member, but this must await further confirmation.